A savory beef dish that hits all the right notes and can be on your table in less than 30 minutes. One of the things I try to do with my blog is make authentic Chinese food easy for you to make in your kitchen. When cooking a different cuisine, it’s often our perception that it’s harder because it’s not familiar. 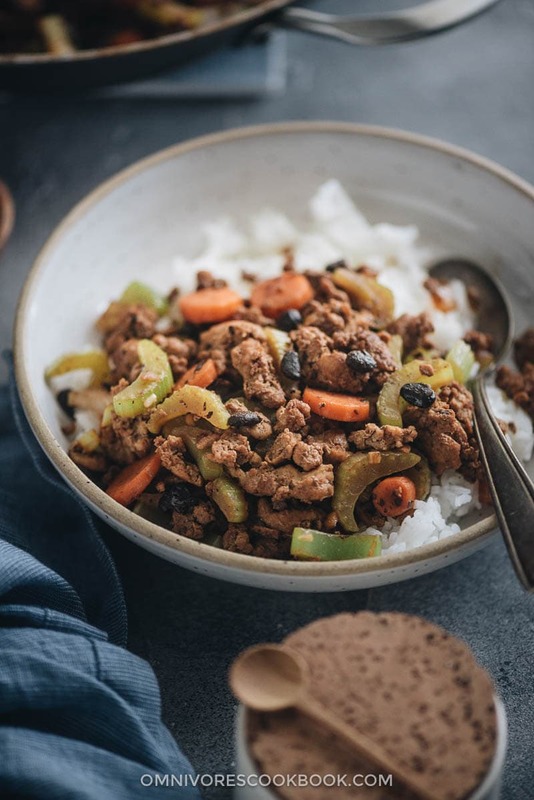 I want to make Chinese cuisine more familiar with this ground beef stir fry, a dish you can have hot on the table in under 30 minutes. It’s incredibly delicious. Enjoy it with rice to soak up all the glorious sauce! Speaking of the sauce, one of the key ingredients I use in the sauce is fermented. Not only does it give you more gut-friendly probiotics in your diet but it helps make the taste extra rich. In Chinese, we call them Douchi (豆豉). These cooked black soybeans are fermented in salt water and give anything you cook with them that deep umami flavor. It will take this simple stir fry to the next level without any extra work. You can find them in an Asian market or order them online (shop on Amazon or The Mala Market). Doubanjiang (豆瓣酱) is a spicier option. It’s a fermented paste made with dried fava beans and chili peppers as the main ingredients. It’s aged for as little as a year to up to 8 years and is very savory, salty, and spicy. It’s used in many Sichuan dishes. Use this one if you want your ground beef stir fry to have a kick to it. Shop for it on Amazon or The Mala Market. In English, it’s called preserved mustard greens. Sui Mi Ya Cai (碎米芽菜) is used in dan dan noodles. It’s made from a very specific type of bean sprout – cardamine – which is native to Sichuan. Once it’s dried, it’s flavored with a variety of spices and sugar and then fermented. The taste is full umami that ranges from sweet to salty to savory. You can use this as your fermented ingredient if you can find it at your local Asian market or order it online. 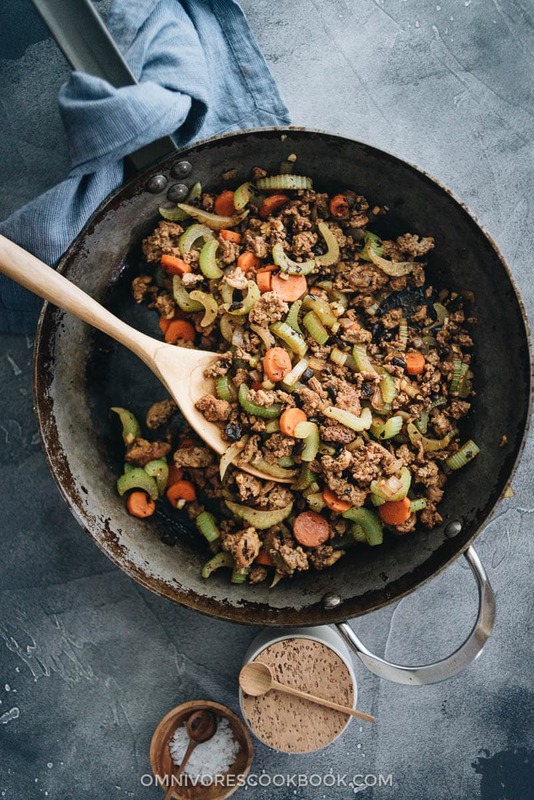 Another thing you should know about this ground beef stir fry is that the other ingredients are flexible, too. 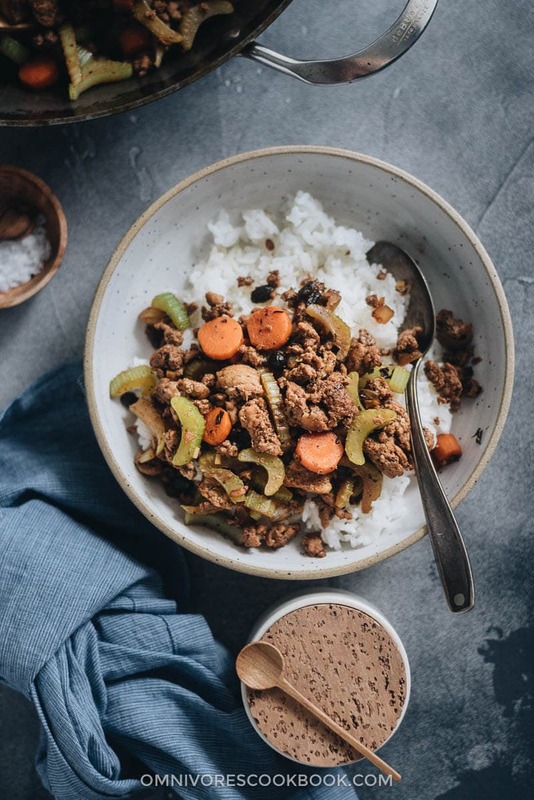 Once you choose a fermented ingredient for your sauce, you can customize this dish to use ground chicken, turkey, or pork. Something else you’ll love about this dish, besides its savory taste, is that you can cook it all in one large non-stick skillet. That means less clean-up for you, which is always a win. Top it on some steamed rice, and you’ll have a dinner ready that is not only bursting with flavor but also full of nutrition. I hope you love this quick, easy, and delicious homestyle Chinese dish. Try it out tonight! Heat oil in a large nonstick skillet over medium-high heat until hot. Add the onion, carrot, and celery. Cook and stir until tender and lightly golden on the edges, 5 minutes or so. Move all the ingredients to one side of the pan and add the ground meat to the other side. Chop the meat into smaller chunks using your spatula. 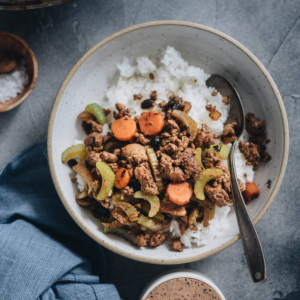 When the surface of the beef has mostly turned white, mix everything. Add the fermented black beans, garlic, and minced ginger. Mix everything again. Pour in the Shaoxing wine and light soy sauce. Cook and stir until the meat is cooked through. Carefully taste the meat and vegetables. Sprinkle with salt and stir to mix, if needed. Transfer everything to a large plate. Serve hot as a main with steamed rice or boiled noodles. To make this dish gluten-free, use fermented black beans or Sui Mi Ya Cai instead of Doubanjiang. Use dry sherry instead of Shaoxing wine, and tamari or coconut aminos instead of soy sauce. 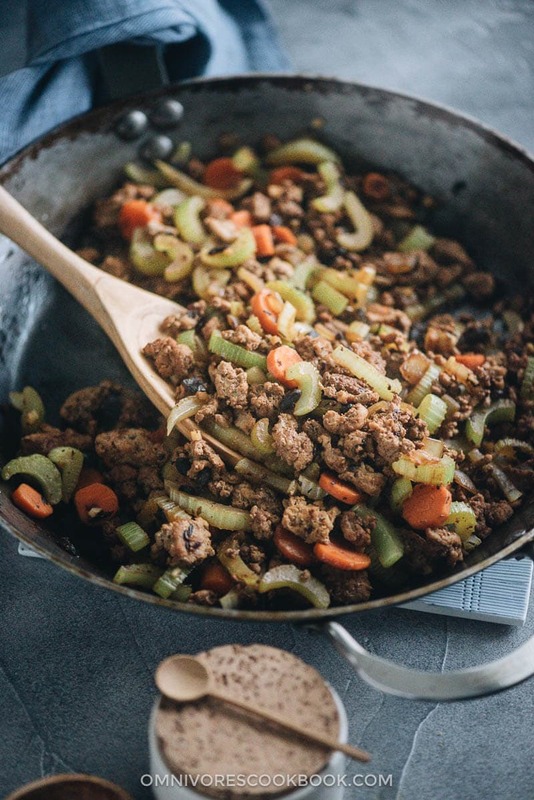 Ground chicken, ground turkey, and ground pork all work very well in this recipe. These ingredients add a ton of umami into the dish and make it truly flavorful. Sui Mi Ya Cai is a special Sichuan pickle that is a key ingredient in Dan Dan Noodles. Doubanjiang is a spicy fermented bean paste used in Mapo tofu. If you don’t have any of these ingredients, replace them with 1 tablespoon soy sauce. I love cooking with fermented black beans – I’ve always got a jar in my fridge. This is such a great quick and easy recipe. And so much great flavor!